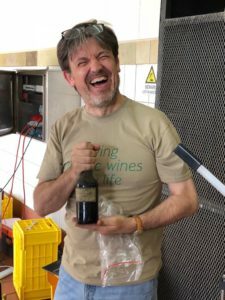 The occasion was a session of re-corking of vintage wines, something Amorim has been doing since the end of last year and which has been extensively written about. De Wetshof, the pioneering wine estate in Robertson, was next on the list for Project Re-Cork, so the Amorim team of Joaquim Sá, CEO and his colleague Bruno Maia trekked out to the farm with sommelier and wine technical expert Jean-Vincent Ridon. 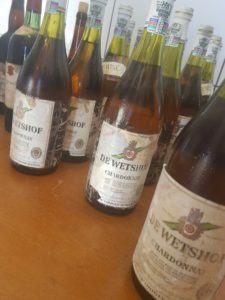 The old corks were relatively easily removed, something Jean-Vincent ascribed to De Wetshof’s insistence on maturing its wines at a cool 9°C. A set of De Wetshof Sauvignon Blanc, also from the 1981 vintage, followed and the wines were equally impressive. Danie de Wet, Jean-Vincent Ridon, Joaquim Sa and Bruno Maia. After opening, the wines were kept under Argon gas to prevent oxidation, topped up with sulphur and a dose of the same wine before being sealed with a guaranteed TCA-free Amorim NDtech natural cork. The team worked in tandem and the procedure was seamless. But in the back of their minds, they knew that the moment of truth was waiting. For one of the reasons for visiting De Wetshof was to recork a bottle of Constantia wine from the year 1821. The old wines of Constantia are the stuff of legend and in the 19th century were consumed by royalty, artists and gourmands. Napoleon was arguably Constantia’s most famous fan and had the wines shipped to him while in exile on Saint Helena Island. Danie de Wet, proprietor of De Wetshof, had purchased his 1821 Constantia in 1983 at an auction held by Christie’s in London and this bottle had been part of the collection in the Duke of Northumberland’s cellar. Until now, the wine had been lying in De Wetshof’s vinoteque but Danie and Johann had decided that a new cork was needed to ensure its longevity. During a previous visit to De Wetshof, Joaquim had assessed the unique bottle and had calculated the size of the new cork that had to be specially made. So with the pristine cork lying to one side and the team holding its collective breath, Jean-Vincent began to pry open the ancient treasure. Out it came, and – remarkably – still intact. A few drops of the 197 year-old wine was poured into a glass, and there was complete silence as everyone marvelled at the brown-gold-emerald colour. Danie was standing three metres away from the glass and exclaimed he could smell the aroma from that distance. 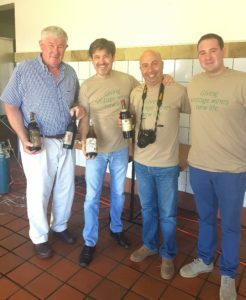 After tasting the wine, Johann and Jean-Vincent exclaimed it extraordinarily vibrant, powerful, expressive and achingly beautiful. And no, the bottle was not going to be topped up to raise its level. It was, said Johann, to remain in the original state. With this stage of wonder out of the way, the tension set it. For the new cork had to be inserted. And with none of the team having an idea how a bottle that was almost 200 years old would react to the punch of the recorking machine, the worst scenario – namely an exploding bottle – was not out of the question. Jean-Vincent wrapped the bottle in plastic to prevent any mess should it break, and the rest of the guys held handkerchiefs should these be needed to dry any tears. Onto the machine the bottle went, we held our breaths and Jean-Vincent pressed the button. 1821 and a new cork…Jean-Vincent’s smile says it all. The cork slid into the neck of that old bottle as if it had been invited. The sigh of relief amongst those present was heard throughout the valley. After spreading some wax on the cork and the bottle neck, the team bid it goodbye as it was returned to the cellar to continue making history. Of which everyone present on De Wetshof that day had been a part of.